It seems that people just can't stop finding different uses for their computers. People are working out of their homes more frequently, either as an offshoot of their companies—in the form of telecommuting, a buzzword that describes laborers passing their work in over the phone lines—or starting their own businesses out of their houses. As an example of this, desktop publishing (or DTP, as it is abbreviated) has become the latest fad on the computer block, enabling anyone with a DTP software package, a decent printer and sufficient RAM to create quality graphics and documents. Cottage DTP shops are springing up all across the nation. As with any new application, the advent of DTP has spawned a whole breed of buzzwords to add to the lexicon. One of the terms that previously existed only for printing houses and publishing firms, but is now being used heavily by computer users, is font, which describes characters of a particular style. Your computer screen shows one type of font; a typed sheet of paper shows another. 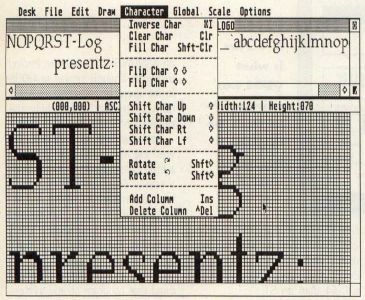 Font Tricks, Charles Johnson's font loader for the ST, was previously published in the January 1987 issue of ST-Log, and gave the user the power to import DEGAS and 8-bit fonts for use as the screen font. To support the font fever in the ST world, Neocept (formerly known as Neotron Engineering, makers of the WordUp word processor) has released a font editing program called Fontz!. Then again, to label it as simply a font editor wouldn't be fair, as it's loaded with other strong features that we'll get to in a minute. Loading Fontz! brings up all of the tools you may need to create or edit your own font. There are eight menu bar headers, such as File, Edit and Scale, for accessing the various functions that Fontz! comes equipped with. 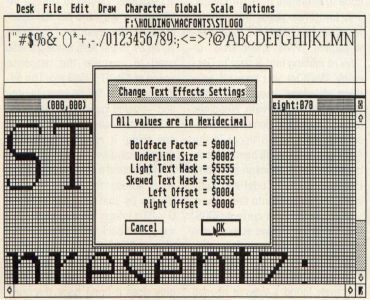 These features—many of which have keyboard equivalents—let you handle basics such as rescaling of a font to a selected point size (a printer's measure where one point equals &frac172; of an inch), changing the font's ID or name, in addition to a multitude of character-manipulation and drawing functions. For instance, you can rotate and move characters within their grid, toggle all of the pixels in a character to the opposite "color," flip a character's pixels so it mirrors left to right or top to bottom, as well as copy and paste selected blocks or whole characters back and forth between the copy buffer and editing grids. Similarly, many rudimentary paint-program functions are programmed into Fontz!, such as drawing a line between two points, arc creation between three points, as well as circle and box (both filled or outlined). These simplify the generally tedious process of creating your own font. I know that some of you reading this are saying, "But, Andy, creating a font from scratch is too much work for me!" In that case, I'll introduce you to what I see as the real power of Fontz!, which is the ability to import font types from sources other than the ST-compatible, GEM format. DEGAS Elite comes equipped with two programs—one for editing and creating fonts, the other for converting them to GEM format—that some users took advantage of to build font libraries. Many of those font artists also released their creations to the public domain. So people with access to an ST bulletin board with a file library or an online service (like DELPHI) have numerous public-domain fonts available to them. And Fontz! allows you to load DEGAS fonts. Another source of fonts is the short-lived Hippopotamus Software company. If you have access to fonts for HippoWord or Hippo Pixel, they can be loaded into Fontz! too. Lastly, Fontz! 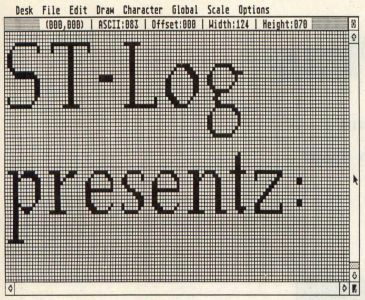 recognizes font files from the Amiga and Macintosh computers. The Mac, in particularly heavy use as a DTP terminal, has a large quantity of fonts available in public domain, as well as through various over-the-counter font packages. With all these sources of high-quality characters, the ST/DTP connection never looked better. Once a compatible font is imported into Fontz!, the user can save the characters in two formats: the standard GEM format, which is being used by DTP and paint programs alike, and the lesser-used PaintworksIN-Vision format. The latter is fairly similar to GEM, but Fontz! will differentiate between the two when you load one in. The manual explains that some incompatible fonts may crash the program, but in my tests it appeared to be mostly bulletproof, with a box coming up when attempting to bring in an incompatible format. The manual is well written, providing over 90 pages of informative documentation. Thankfully the program is mostly self-explanatory with its menus, and any technical situations that you may come across are covered amply in the docs. Even if you make a mistake, the Undo key will usually bring you back to before your last move. One weak spot I noticed was the lack of a cutting routine. There are commands for adding columns and rows to the character grid, but those can only be appended to the ends of the character. If you want to trim out some white space between sections of a logo or similar intra-character editing, you have to go through some pretty involved procedures to accomplish it. Unfortunately the manual wrongly mixes the terms copying and cutting of a block into the buffer: copying should duplicate a chunk while leaving the character intact, while a cut should remove the intended block—much as you would do with text in a word processor. On the positive side of the coin, the documentation does what it can to lessen "GDOS trauma." GDOS is GEM's connection to hard-copy printouts, but information on its use is hard to come by. Additionally, the creation of an ASSIGN.SYS file (that governs what fonts will be loaded in for specific purposes) is discussed at a level that will make it easier for the user to successfully put one together. In summary, Fontz! is a handy tool for DTP purposes, serious business applications or just for fun. The simple mouse- or keyboard-selectable menus make building or altering a font library less tedious. Most of all, it accepts various font resources even from other computers and lets you turn your ST into a powerful DTP workstation.